9/17/2008Share this story on Facebook! Check out Channel Laughter Yoga on YouTube to get a good overview of what laughter yoga's all about. At IC, you'll find more than 150 student clubs and organizations to choose from. Check them out! On a Tuesday morning, I stood in the Whalen School of Music trying to figure out how laughter and yoga could possibly combine. I had heard the Laughter Yoga club doing their thing around campus, but I was never quite sure what was going on. I really couldn’t figure out how or why doing yoga could make someone laugh. I mean, isn’t the whole point of yoga to be serious and still? Curious to learn more, I contacted Sammi Travis ’09, the founder of Ithaca’s Laughter Yoga club, who told me to attend a session and be prepared to laugh. 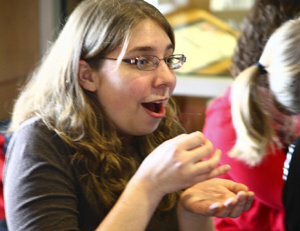 Kristyne Fetsic '11 enjoys a laughter yoga cup of tea. The group started with something called a laughter snowball fight. We split up into sides, crouched down on the floor, and began to mime packing a snowball. As we did this, we laughed, gradually getting louder and laughing more often until we made eye contact with someone and then “threw” the snowball at them, essentially having a snowball fight made of laughter! At first, I felt awkward laughing at nothing with people I had never met. “Laughter yoga isn’t about comedy. You don’t need to be funny or have a sense of humor to do laughter yoga. You fake it till you make it!” Sammi says. So, I faked it at first, and soon enough, I was truly laughing. Even if you're faking the giggles, you still reap the benefits. As ridiculous as this snowball fight sounds, by the end of it I was out of breath and working up a sweat. Sammi brought us back to “order” by clapping and chanting “ha-ha-ho-ho.” This is where the yoga part came in. “We don’t really do ‘yoga’,” Sammi explains, “but there is a lot of yoga breathing involved.” We formed a circle and did deep breathing exercises to get the oxygen circulating in our blood. During the hour we had together, we did a number of funny exercises like English tea party and laughter karate. An English tea party involves standing in pairs or small groups, miming as if you're holding a cup of tea in your hands. As you bring the cup up to your lips and back down, you laugh like a posh Englishman. Laughter karate is also lot of fun; bow to your partner and then start punching or kicking (without making contact of course), laughing all the while. The session concludes with laughter meditation, which consists of lying on the floor ... and laughing. It was both a great way to relieve stress and oddly enjoyable. It was meditation through laughing with others. By the end of the session, I was dripping with sweat but feeling great. Although I had been sick for seven days before this yoga experience, I felt like a new person. I have to admit, I was skeptical at first. But, running around a room and laughing with a bunch of strangers was both invigorating and liberating. I couldn’t stop smiling for the rest of the day. In the end, is there any better way to get rid of stress than to laugh? I don’t think so. 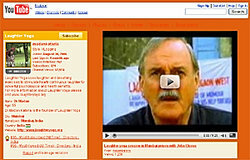 The very funny British actor John Cleese meets with Dr. Madan Kataria, creator of laughter yoga. 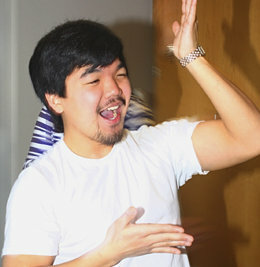 Most people have no idea what laughter yoga is, but it is popular in some parts of the world. It was created in India by Dr. Madan Kataria, himself a student of yoga. He discovered that, whether real or fake, laughter does wonderful things for your body. It helps lower cholesterol, boosts the immune system, provides an internal message, and helps fight depression. Yes, I do, and so do many others across the globe. There are 6,000 laughter yoga clubs worldwide. Anyone can do it--if you're curious, give it a try!